The sense of freedom that you enjoy when you’ve got an anytime ticket sitting snug in your pocket is second to none; you won’t have to cram yourself onto the tube and nestle your face in an armpit to make the 6:05 train home, or do a weird half run/half walk from your meeting to the station in order to avoid an awkward chat with the ticket inspector. You can stroll around leisurely, checking out all that M&S Food has to offer. That said, anytime train tickets are the absolute scourge of any organisation’s business travel budget. In fact, book a few poorly timed anytime tickets and you’ll soon find that your budget has been sucked dry – anytime tickets are the most expensive you can buy, usually double the price of a standard ticket. Look to see whether meetings can be arranged during off-peak travel times, as this will instantly give you a better rate. Secondly, remind your team that they can have the best of both worlds by booking a cheaper, set time on their outward journey and then enjoy the flexibility of an anytime return on the way back. That way, the traveller isn’t inconvenienced and the ticket cost is reduced – win/win. When your team book a flight they’ll usually know when they will be travelling or when their meeting will be finished and therefore they book a fixed ticket, which gives them cheaper fares. Encourage them to apply this way of thinking to booking train tickets and as a result you should find that your travel spend will dramatically decrease. Does it hurt to ask if a meeting can be arranged to fit around off peak travel times? No – it definitely doesn’t hurt. Can it be awkward? Maybe, but bearing this in mind when arranging meetings is a good way to save on your train spend. If prices are particularly steep when you or your team are looking to travel then consider booking an off peak ticket both ways and staying overnight instead of buying an anytime ticket – believe it or not this can sometimes work out to be much cheaper. Store this advice in the same file as “don’t stand under a tree during a storm” and “always be prepared”. 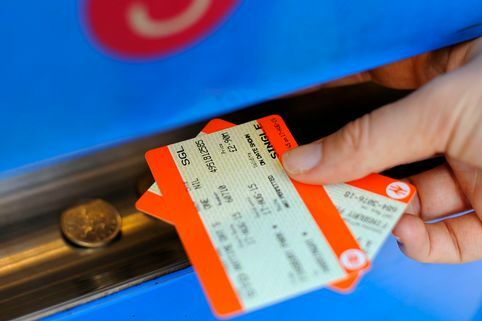 It’s pretty self explanatory but on some routes it can make a real difference to the cost, especially on routes where advance tickets sell out quickly like London to Manchester. First up, if you don’t have a travel policy then it’s time to consider implementing one, as a travel policy will state which type of ticket (or more importantly, which ticket prices) your team are permitted to book. If you’re a pro at policies, or if you’ve just thought about implementing one, then check that it’s dynamic, so that its controls will adapt depending on the options available at the time of booking. For example, instead of saying a rail ticket must be in standard class, you say it must be within X% of the cheapest option. This means that if an anytime ticket falls within X% of your specified spend then your team can go right ahead and book – everyone’s happy. To start using a platform that’s easy to use, full of all the content that you’d find anywhere else and can provide seamless integration of your travel policy, get started with Click Travel today.